With 15,246 Sq. Ft. of built-up area, this makes this luxurious property Dubai's largest five-star hotel penthouse. 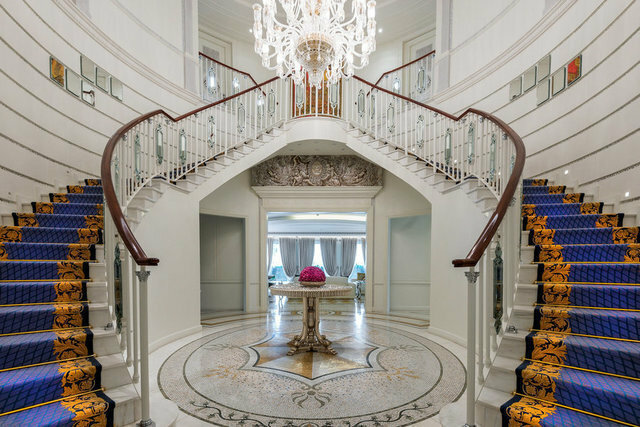 This lavish six-bedroom duplex, located in world-renowned Palazzo Versace hotel, has no equal. Vastu compliant, this ground level duplex with an in-house elevator boasts 6 en-suite bedrooms (master bedroom includes his and her walk-in wardrobe and bathroom), your own private pool, garden and terrace, 2 staff accommodation rooms which can accommodate up to 6 staff, 10 parking spaces – the best allocated in Versace, and panoramic views of the Canal, the Marina, the central lagoon pool, and gardens. Palazzo Versace, a waterfront masterpiece combines true fashion and opulence. Amenities include world-class dining and spa facilities, 24-hour security and concierge. Next, to D1 Tower and the upcoming Museum of Middle Eastern Modern Art, it is uniquely situated on the Creek with direct access to Al Khail road. You are minutes from downtown, DIFC, and DXB.